Wing span: 7/8 - 1 3/8 inches (2.2 - 3.5 cm). Identification: One tail on hindwing. Upperside blue-gray with large red spot near tail. 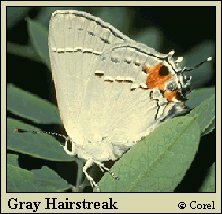 Underside of spring/fall form is dark gray, summer form is paler gray. Relatively straight postmedian line is white, bordered with orange on the inside edge. Life history: Males perch all afternoon on small trees and shrubs to seek receptive females. Eggs are laid singly on flowers of host plant. Young caterpillars feed on flowers and fruits; older ones may eat leaves. Chrysalids hibernate. Flight: Two flights from May-September in the north, three-four flights from February-November in the south. Caterpillar hosts: Flowers and fruits from an almost endless variety of plants; most often from pea (Fabaceae) and mallow (Malvaceae) families including beans (Phaseolus), clovers (Trifolium), cotton (Gossypium), and mallow (Malva). Adult food: Nectar from many flower species including dogbane, milkweed, mint, winter cress, goldenrod, tick trefoil, and white sweet clover. Habitat: Open, nonforested sites; common in disturbed, weedy areas. Range: Throughout continental United States from southern Canada south to Mexico; southward to Venezuela. Comments: The most widespread hairstreak in North America. Management needs: Caterpillars may cause economic damage to bean and cotton crops.